Initially your doctors and nurses give you activity guidelines for early discharge from the hospital. Within a few days or weeks however, you start to ask can I do this? Or you do something and a family member suddenly yells “You can’t do that. It’s not safe! !” So what is safe? Well it is very individual, based on your health. In Cardiac Rehabilitation one of the ways we advise people is through use MET levels. MET levels refer to how much energy your body needs to do a particular activity. At rest your body uses approximately one MET. The physiology world knows this means your are using about 3.5 millilitres of oxygen per kilogram of body weight per minute to allow all your organs to have enough energy to operate. If your body isn’t conditioned to high levels of activity then you could get into trouble. You want to gradually build up. An example I use is if your body is conditioned only to a 3-4 MET level, and you plan to go and shovel wet heavy snow – which requires approximately 10 or METS then this activity is potentially dangerous, as your heart may not be able to meet these demands. Determine what is the activity you would like to do. Is it raking leaves, biking hills, carrying heavy loads up the stairs, lifting a ladder etc? 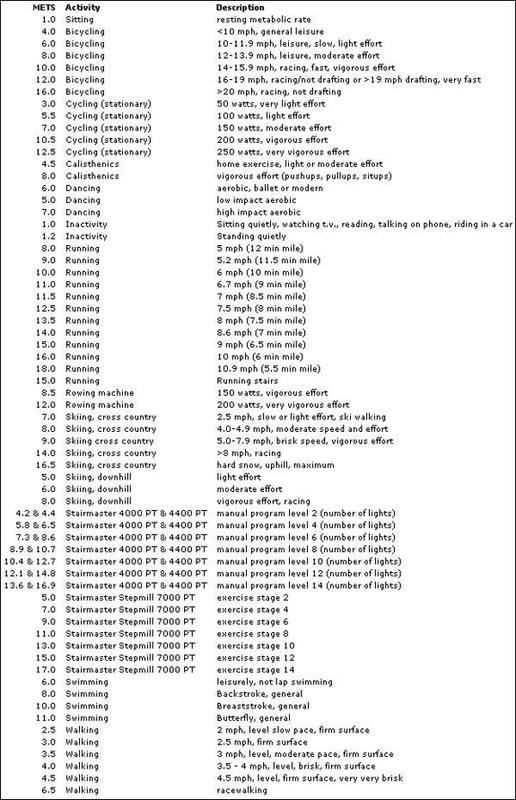 Below are a few charts to help you see what the MET requirements are for typical activities. Then gradually increase your exercise activity until you are able to get to that MET level and sustain it for a period of time. So how do you determine what MET level you can do? Some exercise equipment will tell you what level you are at. Often you need to enter your weight into the machine to properly calculate. The charts below are helpful for estimating the MET requirements for activity. This is great information, thank you for sharing and creating this blog. By the way, I appreciate your support by stopping by NutriSpire, giving me a like and following me.